While training for Paris I'd decided to avoid an autumn marathon, having done Paris & Edinburgh, and concentrate on a series of shorter races - 5k to half marathon - before training for a spring marathon next year. A few days ago that was very much still the plan. I felt enthused at the prospect of Edinburgh, had begun to lose weight again after 10 days of post-Paris excess, felt good fitness wise and had looked up a series of races I could do. The weekend has raised some big doubts though. The pain in my leg suggests that I'll struggle to train for Edinburgh and will greatly risk injury if I do - so do I pull out? If I do, does that leave the option of an autumn marathon? I don't really want to withdraw from Edinburgh. I've paid my entry, planned a new target time for a PB, am 2 weeks into an 8 week plan and fear if I withdraw my diet and fitness could go to pot. 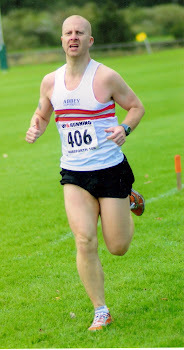 On the other hand, if I do withdraw I can let the injury heal properly and still go for the series of summer and autumn races and hope they are enough to keep me on track weight and fitness wise. I'd also save about £200 - not including £90 I can put by for a chi running course I'm signing up for in June. Sue's advise is to withdraw and, in writing this entry it seems the sensible option. If it was the only planned marathon for the year I'd refuse to contemplate that but having done Paris recently its easier to think that way. The initial post race euphoria soon wore off as my legs started to stiffen up after sitting on a kerbside in the bag reclaim area. While there i switched on the mobile and got a message from Sue to say they were somewhere at the finish. That was great though finding each other was taxing. It shouldn't have been as all we had to do was to say meet at a clear meeting point but Sue isn't great with directions and it took several calls and about 20 painful minutes hobbling/standing before we met up. Getting a Metro wasn't easy either. The queues at Charles de Gaulle Etoile were enormous - literally four abreast and 100s of metres long - so we made our way through and out again with Charlotte bravely leading me, and then down the now bustling Champs Elysses for half a painful hour before getting a train from a quieter station further along. When I got back Bethan was still feeling poorly so that evening I stayed in with her while Sue, Charlotte, Eleanor, Olivier and the boys went to a local restaurant. By 9pm I was completely shattered anyway and went to sleep. The next couple of days were painful. We did the whole tourist thing on the Monday - Notre Dame, bateaux mouche, Eiffel Tower, Arc de Triomphe, Champs Elysses, Place de la Concorde, Tuilleries Gardens - and that involved a reasonable amount of walking and an overdose of ibuprofen. While ever I had 800mg of ibuprofen in me and my legs were warmed up I wasn't too bad - slow, but ok - but if the dose fell or I sat for a while my legs were painful. I couldn't walk quickly and my leg muscles were prone to occasional spasms that had me freezing or jerking like the late Jack Douglas in a Carry On film. The next day Sue was unwell with the gastric bug so I took Bethan out. We'd aimed to get to the Musee d'Orsay by 9am but problems getting a taxi meant we ended up walking there, arriving about 10.30 by which time the queues were absolutely enormous. Generally my legs felt easier but the pain in my front lower legs was very strong whenever the pain killers were wearing off. We went back in time to take Charlotte out to a quirky little Bengali café then in the afternoon Sue was well enough to go out so we made the simple Metro journey to Parc de la Villette, which was pleasant enough even though virtually all the children's attractions were still closed. In the evening I took the 2 girls to a local restaurant. By the following Saturday my legs felt pretty much fine and I took Bethan out for a 2 mile jog/walk with no ill effects, but the following day my planned 4 miles gave me pain from the off and I had to abort it after 2.5 miles. Two days later I did manage 4 miles - starting very slow but getting progressively faster - and a further 2 days on I did another 4 pain free, this time far faster. It was the quickest run I'd done this year. Great to be able to do that 11 days after a marathon but maybe not the wisest move. This last weekend I did 2 miles jogging with Beth on Saturday and planned to do a slow eight miles on Sunday. In the end the 8 miles turned into 10 and I ran it faster than I've ran a 10 mile race (though I've only done 3 ten milers and they were all hilly). I had some lower leg pain on the right side after 3 miles but as it didn't get any worse I ignored it. The way it feels today makes me wonder if the right course of action would have been if it doesn't get any better, stop running, or at the very least slow down to the pace you intended to run at and not the minute and a half per mile faster that you've inadvertantly ended up at. I'm my own worst enemy. On Runner's World I advised caution - that you'll feel really good but don't be tricked into running too fast or too hard too soon - and that I had experience of that before. I've then gone out and done the exact opposite myself. I think its rest time for a few days at least. Through most of my long training runs I've ran at a consistent pace of round about 9.30 - 9.45 a mile, and this is the typical pace I wanted to run at until the inevitable slow down in the last few miles of the marathon. Consequently miles 8 and 9 through the Bois de Vincennes were done at 9.30 and 9.27 respectively and I began to pass a number of the runners who had earlier passed me. Generally from here on in I spent most of my time passing people which was a psychological lift even though it meant a good deal of weaving in and out, bursts of speed, or jumping up and down kerbs. In the BdV though it was relatively easy as there were no parked cars lining the route or lines of over eager supporters encroaching on the road - if you wanted to pass you could - though I did see the first casualty there in the form of a lady with a gash to her head probably from a fall onto or off a kerb. It was also about this point in the park I began to spot the flags of the 2 pink 'hares' up ahead as I started to reel them in a little sooner than anticipated. By the 10th mile I'd caught them at a drinks station and despite that mile taking 10.59 thanks to the subsequent walk and my third and final wee I stayed ahead of those hares for the remainder of the race. Little did I know that they had a friend further on. 9.38 for mile 11 as we left the park and 9.17 for mile 12. The 9.17 mile had been quicker than planned so I slowed it a bit for a few 100 yards and walked through another drinks station to give 10.27 for mile 13. The only concerns by half way were a slight niggle from the blisters (that came to nothing in the end) and the cramping stomach pains I'd get for a minute or two after each drinks station. Net result was a number of miles where I felt strong and confident running back to Place de la Bastille, past the Republican Guard band, to the river and along the Seine towards the home straight. The miles timed right on track at 9.32, 9.44, 9.34, 9.24 through to 17 miles, even including a drinks station walk. 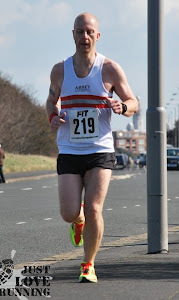 I was really enjoying myself at that point, leading to an unplanned 8.55 mile for mile 18 before a deliberately slower 10.00 for mile 19 to balance it out. This period included the 2 long tunnels and the section where passing runners was constant for me but where it was difficult to do so. I enjoyed the tunnels. In the first one a band played some Yann Thiersen music from the film Amelie at the entrance and the runners in the tunnel kept producing a sort of Mexican wave of sound back and forth. I joined in with full vigour and again really enjoyed the participation. Round about mile 19 I had the slight shock of seeing a pink hare ahead. I'd assumed they were long since left behind and was certain none had gone past me in my recent quicker miles so I can only assume there were 3 with this one starting at the front of the pen and the others further back, hence he was hauled back round about on schedule. I wanted to get past the hare as there were a bunch of runners behind each making it congested and difficult to pass people. Mile 20 included another water stop for a 10.22 mile and 9.57 for mile 21, including passing the pink hare. I can't recall if the 9.57 was due to deliberately conserving energy a bit or if it was just a sign of fatigue. Mile 22 was a problem though. Running alongside Roland Garos I was feeling good still but then started getting pain on the inside of my left knee and felt everything tighten up as I began to limp as I ran. I stopped and stretched all surrounding muscles and both calves - hoping that the knee pain was due to muscles cramping up either side - then hobbled on in the pack of the pink hare that had caught and overtaken me as I stretched. 10.36 mile as a result. The slow 10.57 mile 23 included another walk through a drinks station and another stop for a stretch, and as well as taking my gel and water I took the opportunity to tip soothing cold water on my knee and also the now also aching lower calves. I set off again, keeping pace with the hare's entourage once more. Mile 24 stayed at the same sort of pace - in with the hare's followers and a 10.09 mile as a result. Thankfully the knee pain began to fade but only as the overall feeling of fatigue grew. Counting the km signs at 37, 38 and 39 seemed painfully slow and was accompanied by a return of stomach and lower back pain from my bad stomach. Mile 25 saw me slip ahead of the hare and his gang, aided and abetted by only a very brief drinks stop for a cup of Powerade and my Overstims 'Sprint Air' gel, 9.55 the time. Mentally and physically I felt a strange mix of exhaustion and strength that's difficult to describe, and I felt tempted to try to push the pace as more and more runners were passed but decided to hold off until the 41km marker. Mile 26 as completed in 9.48 and at the end of that I had started to speed up which was strangely exhilarating. The final 0.53 miles (I'd ran more than the 26.2 miles through weaving, weeing and deviating off the blue line) were done at 8.11 pace giving an enjoyable struggle for the last few hundred metres. I crossed the line feeling good, though momentarilly confused as the big race clock had stuck on 3:55, but I later found my time to be 4:26:45. Very happy with that. I went through the chutes, gave the medal a small kiss, met another forumite and headed off for my bag. I'd gone into the race with a plan. I'd made a rudimentary pacing schedule & band with a fairly conservative target for the first few miles but events meant I was behind by almost 3 minutes even after only 4 miles. 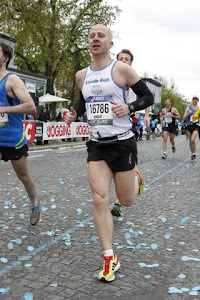 The first mile down Champs Elysses was deliberately slow, being passed by eager runners regularly (which was part of the plan) but a toilet stop in the gardens before the Grand Palais meant I was 48 seconds off the pace with an 11.13 opening mile. I'd assumed that the late loo trip before going into the pens would mean I wouldn't 'go' again but a slight urge after the pre-race drinks was too hard to resist - after all it would mean no further delays for toilet stops. Wouldn't it? On Rue de Rivoli it was all fairly familiar from 2007 but it was still interesting to see the variety of different nationalities in the race, including the 2 rubenesque Swedish girls, one of whom stopped and bent over (not crouched) right in the middle of the street in front of me to do up her shoe lace. It was as if she wanted to play leapfrog. I declined the apparent offer and ran around her. It was also interesting to see the runners anxiously scooting past as if late for a train. I thought to myself then that I'll pass alot of you later, and I was proved correct. The other group that passed me a little over a mile in were the 4:30 target time 'hares' with their pink flags. Again, I was happy to let them go even though I was aiming to be under 4hrs 30 by a few minutes. Based on my guess of their approach I assumed they'd pull away in my deliberately slow first miles but that around mile 18 I'd catch them up and overtake, and I proved to be sort of right. Mile 2 was almost bang on the money at 10:30 against the target of 10:25 and mile 3 was a little bit quicker than planned at 10:08 but mile 4 proved a bit of a timing disaster. I'd planned to walk through the drinks stations as they can be tricky to get through and its easier to drink walking than running anyway so I guzzled down my first gel as I approached the Place de la Bastille station then slowed to a walk while grabbing a water, piece of banana and slice of orange. As I walked around the corner the whole route was blocked by a bottleneck of runners caused partly by a tight narrow bend and partly by the road there being absolutely full of discarded bottles making it impossible to do anything other than walk very, very slowly and carefully. Once past I began to check the left hand side of the road to see if the family were there in support. I didn't really think they would be with Bethan being unwell and I was right - she was still being sick well into the morning. What I did see was the entrance to a car park or closed shopping arcade being used as a toilet by a number of runners and I'm afraid I followed suit. My bladder was grumbling again and once more I thought 'If I go now at least I wont need to go again'. And once again I was wrong. The time for the second toilet stop, added to the delay at Bastille, meant 12:36 for the 4th mile and I was 2m 36s behind plan. There seemed little point in worrying about the overall time at that point, just concentrating instead on hitting mile goals moving forward but without trying to catch up lost time. What was gone was gone. The next mile, at 9.52, did just that. It hit target and chipped off a few seconds to boot. It was about this time I made the conscious decision to interact with the crowd - something I had almost scrupulously avoided in 2007 - by clapping the various entertainments and high fiving the kids that lined the route. I seemed to feed off their resultant support and it worked well for me - I even went back for a couple of kids I'd missed at one point! The 6th mile continued with wide, uncongested boulevards and had a few long but slightly downhill stretches which, all combined with feeling good, led to a faster than planned 9:19 so I made myself slow a little more in the 7th mile, which also included another drinks station, for a 10:36 mile. I appreciated the down hill sections this year. There aren't many slopes at all on the route but this year the uphills caused no bother but I found the downhills a real boost, psychologically at least. As I walked out from the second drinks station I heard a call from Andy who was just overtaking me. He'd started a little behind me but despite my running a couple of brisker miles was going serenely past. I suspect I passed him back shortly afterwards but didn't see him and I subsequently found he'd felt the later stages hard work, but he'll have learned from the experience and will come back far better. The trip to Paris was largely uneventful. The flight was delayed and the departure lounge busy, but I stayed pretty chilled and enjoyed a short flight to Paris. Baggage collection was also brisk and the only delay was in waiting around for 20 minutes for a taxi big enough to fit us and our cases all in. Overall I felt quite chilled about everything on the trip. Not perfect serenity perhaps, and Sue might disagree, but I felt relatively calm compared to how I thought I might be. After a decent night’s sleep I met Andy, another poster from Runners World and his 2 friends and we made our way across Paris on the Metro to Porte de Versailles and the Expo. Number, t-shirt and bag collection were simple and quick and the Expo itself big but with nothing to tempt us to part with any money so we got the train back to Place de la Republique and had a quick coffee before I took my leave and headed back to the apartment. A quick trip to the supermarket later and I took to my bed. This was partly to take it easy but also because I’d begun to feel a bit ropey - just tired, a little weak and very, very bloated. I guessed that my new found wind production was down to nerves, the high sugar carb loading diet (I was still eating mountains of jelly beans) or a bit of both. I later found I was wrong. I was feeling a bit stir crazy by the evening so we went for a half hour walk and at the end of it went to the bar we’d been to a couple of times in 2007 for some food. A vegetable cous cous was pretty plain but it ticked the carbs box, then it was back to the apartment, alarm set and bed. It wasn’t the best night’s sleep. I woke a couple of times needing the loo - but at least I was well hydrated - and at 2.45am the eldest woke up with stomach pains and vomiting. Happy days. Sue had taken on board all that I’d said about support last time and had offered to come to the start, finish and in between but we settled on Rue Faubourg Saint Antoine - as long as Bethan recovered quickly - but I also dropped unsubtle hints about her waking up at 5.30am with me. This she duly did and even made me a coffee. That meant a lot as having someone with you then made the early start and the nerves far more tolerable. At 6.30 I sauntered off to meet Andy at Place de la Republique and, after realising there was nowhere open to get Metro tickets, we got a taxi to the Arc de Triomphe. 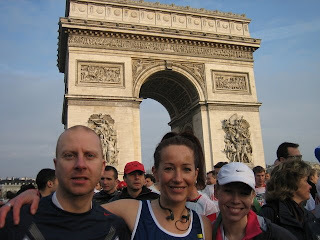 We ambled down Avenue Foch at sunrise and stowed the bags, opened the bomb bay doors in the chemical loos and made our way up to the Arc de Triomphe where we met a number of other Runners World forumites. That was good as for months I’d enjoyed the Paris thread - it had been a real support for everyone in their training trials and tribulations - so putting faces to names was fun. I’d probably started to become mono-syllabic with nerves as time went on, felt full of wind and gripey pains and had to make my apologies and zip across to Avenue Foch again to have a wee on the flower beds at about 8.20. When I came back everyone had set off for the pens but I did spot another couple of forumites on my own way there. Getting in the pens was a bit chaotic but once inside all was well, though I did feel a bit shivery and was still getting abdominal grumblings. The gun went and we began to make our way slowly towards the start line, old running top discarded, I got a signal on the Garmin and prepared to set off. Friday afternoon, with about 40 minutes to go before the taxi arrives to take us to the airport. Family is going through its usual pre-departure stressing. Normally I'm the ring leader and star performer of that particular circus but I'm pretty chilled right now. All packed, I don't think there is anything I've forgotten, pace for Sunday worked out. Its just a matter of getting there, doing the Expo thing, having a little run on Sunday then we're all done. Only concern is the weather. The forecasts for Sunday that I've seen over the last week started off as the upper teens and sunny, switched to dull, drizzly and 13c but then sadly now seem to be pointing again at about 20c and sunny. That's going to be tough for everyone, possibly me more than most, but not as bad as 2 years ago by a long way. Hopefully the peak temperatures will be after I've finished. This week I did 5 miles on Tuesday and 2 miles yesterday, the latter at 14c and I was sweating buckets even then! Only big decision made was to run in the old Paramounts rather than the new ones. The decisions still to be made are whether to wear sunglasses or a cap or neither - and for that I'll need to find a weather forecast on Saturday; and whether to wear a dressing over the blister. Blister is healing well and to all intents and purposes is healed but even after 2 miles I can feel a slight rub on the soft new skin which suggests a dressing for 26.2 miles might be advisable. Only risk of that is the dressing bunching and causing a new blister before I realise. Have to wait and see.